After the Opium Wars, Christian missionaries flooded China. 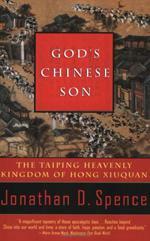 Hong Xiuquan, a failed student of Confucian doctrine, found success after converting to Christianity. Hong claimed that he was the younger brother of Jesus Christ and started the Taiping Rebellion that lasted more than a decade and cost more than twenty million people their lives. Hong’s goals were to replace the Ch’ing Dynasty and rid China of Opium. After achieving that goal, he was going to convert China to a Christian nation and he would be the first Christian emperor. Since the English and French did not want the opium trade stopped, these Christian nations helped the Ch’ing Dynasty defeat the Taipings even though the rebellion was a Christian uprising. I wonder if Liu Xiaobo had this in mind when he said what it would take to change China to be as Hong Kong is today.